Royal Seals of the Crusades - Set of Four. We have gotten numerous requests for a set of royal seals. This first series, expertly made by Marto of Spain, is based on ones used during the Third Crusades. Each of these round seals can be screwed into the wooden handle and be interchanged in seconds. 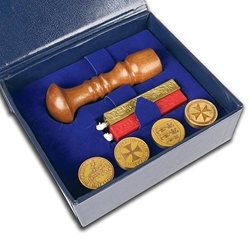 Included with this set are four seals, a wooden stamping handle and two waxing candles, one red and one gold. All arrive in a stunning display box suitable for any office. Seal diameter: 1 inch each.